She seems like a pretty strong person, IMO. thanks SG....PCharlene comes off really well not trying too hard just herself, very confident...guess all those years of being an athlete really helped her in dealing with pressure.. I've heard some negative things about Charlene, but I like her better than Kate. Although she needs to stop with the plastic surgery. In the interview, she comes off relaxed & confident & not fake. She seems to be herself. She has nothing really to prove because of that training and her accomplishments. Great for Charlene! She needs to make her useful and to prove herself ! And by the way she seems more natural and kind with children then this rubbish Kate....I like more and more Charlene than Waity ! I think she did a wonderful job speaking in her first official speech accepting this award, for her work with children through her sport over the years. I think she puts Kate in the shade, as far as dressing and behavior, IMO She is pulling it together quicker than Kate and already out there doing charities on her own and speaking. I see more promise with her, she seems capable of taking on charities without excuses. She looks very elegant and she has the Grace kelly´s bun. oh Princess Charlene is going to the Oscars... somewhere Waity is throwing a *female dog* fit.. 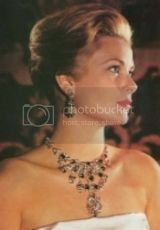 It's supposed to have something to do with honoring Princess Grace. I think it's also in line with those stories about a movie being made about Grace. Albert and Charlene might be in talks with a few producers, and those produces probably want to have the couple on their side. Oh I think kate might throw a huge hissy fit over this! I wonder if she ever asked to go before? My guess, they said something along the lines of "It's not done for a princess!" Kate's probably going to make Pr.William take her to the BAFTA'S now. Well, Prince Albert's mother was a film star. He actually has connections with Hollywood. What is Kate's reason for going there? She has none, so she wasn't invited. Kate wants to be friends with the moviestars, I think. ^ That's just mean... not everyone has the gift for learning new languages. Some people struggle with it. Yes, but wanting to be friends with movie stars is different than being to son of a Hollywood legend. Albert would know some people (he also has an American daughter, but that's beside the point), and Kate only just went to the USA for the first time last year. No connections at all. I can see why Albert is attending. I have never understood the point of Kate and William coming to California.